Claire Banasiak, chair of LWV-Greater Cleveland’s Bay Village chapter, presents a $10,000 check to Bay Village Council President Paul Koomar. 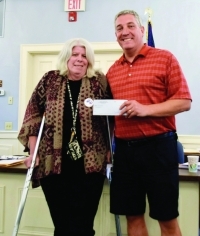 The Bay Village City Hall microphone project moved another step closer to completion at City Council's June 29 meeting, when Claire Banasiak, chair of LWV-Greater Cleveland's Bay Village chapter, presented a check for $10,000 to Council President Paul Koomar. The total cost of the project, which is expected to be completed by early fall, is estimated at $16,000. High-quality microphones will be purchased for Council chambers and for the conference room where committee meetings are held. As noted in the LWV's presentation letter, by accepting the gift, the City agrees to install and maintain the system and to "record all open meetings and make recordings available to the public at no charge through the city web site for both listening and download." 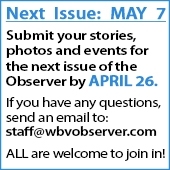 Since May 18, Council has been posting its meeting recordings to the web. However, the sound quality is poor. Superior pickups will produce clearer recordings – and speakers installed in Council chambers will allow audience members to hear better as well. Finally, high-quality recordings will enable use of voice-to-text transcription software, resulting in thorough, efficiently produced minutes. Council President Koomar, along with Councilman Paul Vincent, who chairs the Services, Utilities and Equipment committee; Council Clerk Joan Kemper; and Bay's LWV chapter treasurer Alex Dade are to be commended for their hard work on this project. For years to come, it will improve access to – and the League hopes involvement in – city government.